Longitude 48.426638 Latitude 4.679393. The Kerloas Menhir or Menhir de Kerloas stands on a low mound in open countryside 2 miles east of the village of Plouarzel in northern Finistere. The nearest town is Ploudalmezeau 7 miles to the north. A footpath takes you 200 metres south from the D5 Kerloas road to the giant standing stone that dates from the Bronze-Age around 3,000-4,000 BC and, to a prehistoric monument that can be seen for many, many miles around – although today it is missing it’s top section after lightning apparently struck it at some point in the distant past. The menhir stands at the southern edge of the Bois de Kervealouz forest. This is probably the tallest “standing” stone in Europe. At 9.5 metres or 31 feet high this smooth granite standing stone which was quarried at L’Aber Ildut a couple of miles to the north-west is quite a remarkable sight. But originally it was approx 40 feet high before it lost the top 2 metres or so during a severe thunderstorm 200 years ago. The top part was blasted away by a lightning strike, some of the large pieces being sent over a large area landing in the nearby forest and on a farmhouse. It has a huge girth with a “quadrangular” tapering base; the shaft also gradually tapering away near the top where the breakage has occured. It’s estimated weight is 150 tonnes. Beneath the small round-shaped mound on which it stands there are said to be a several more metres of stone. About three feet up from ground-level on two sides there are two strange feminine-like humps or protuberances in the menhir – giving it the appearance of a hunchback person, but nobody seems to know why, or what, they are for. They are, however, probably associated with fertility? The mound beneath the stone is probably the remains of a tumulus where there was a burial of a chieftain, or maybe more than one chieftain – indeed the area around the site is called Kerglass ‘field of grief’. According to local legend, upto 100 years ago young, newly married couples would visit the Kerloas menhir on their wedding night in order to improve their family prospects. The woman would rub her naked body against one of the humps in the stone, while her husband would do the same to the other hump. These strange occurrences were performed in order that the man would receive a male child, while the woman would become the dominant one in the house. 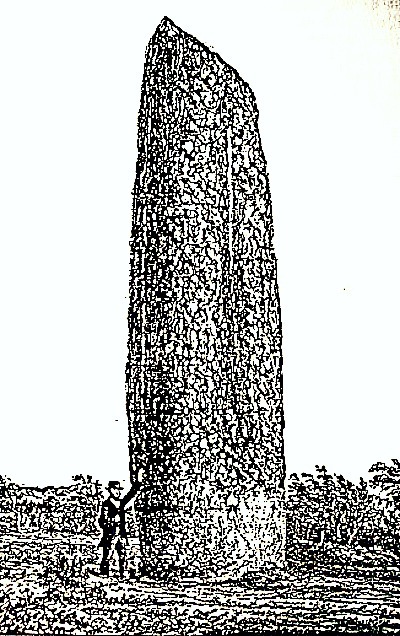 It also seems probable that the woman would help her childbearing on by climbing the menhir to the top naked and then sliding back down it again, but whether all this clambering all over the stone helped we don’t know, it probably would have caused the woman much bruising and friction burn in the meantime! Other legends claim there was buried treasure beneath the stone (grave-goods), while a very far-fetched legend claims the big stone wanders off every night to take a drink from a river, or even the sea! Now that is indeed far-fetched. Briard, Jacques., The Megaliths of Brittany (Giseserot Edition), Rennes, 2001. Categories: Kerloas Menhir at Plouarzel in Brittany, Standing Stones | Tags: Kerloas Menhir near Plouarzel in Finistere Brittany | Permalink.